I was using Windows 10. Then I installed Ubuntu 18.04 LTS as multiboot. Grub2 replaced Windows bootloader. 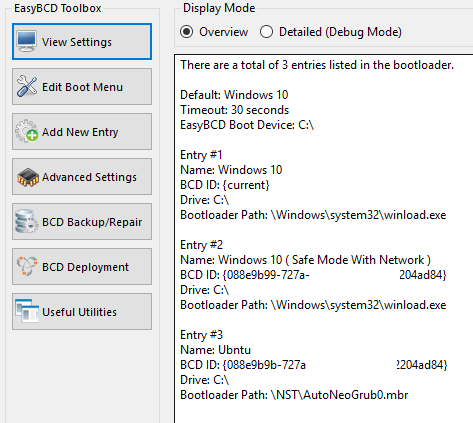 So I installed EasyBCD 2.3 on my Windows 10. Created a new Linux entry on it. When I booted I had two entries, but instead of booting to Ubuntu it booted to "grub4dos". I used "boot repair tool" via live USB. It reinstalled "grub2". But now I have two boot loaders. Grub2 loads first. Then, when I select Windows 10 from it, Windows boot loader loaded up. I have to select Windows from it to boot into Windows 10. As I use Windows 10, regularly. I have to go through two boot loaders to get to my Windows 10. I like to have either Grub2 or Windows bootloader which boots both OS with single click. I use Laptop with single HDD. I had tried different options on EasyBCD but every time I end up using my "boot repair live usb" to reinstall Grub2. Not the answer you're looking for? Browse other questions tagged dual-boot grub2 18.04 windows-10 bootloader or ask your own question. How can I add an entry for Ubuntu to the Windows 7 boot menu?